Heat exhaustion means that your vital organs aren’t getting enough blood. With less blood available, you will feel light-headed and weak. a fast, weak pulse; fatigue; confusion; and anxiety. If you’ve taken steps to relieve heat exhaustion but your symptoms get worse or don’t improve after 30 minutes, get medical help without delay. Heat exhaustion may lead to heatstroke, a condition in which your body temperature elevates to dangerous levels. The signs of heatstroke range from confusion to unconsciousness; slurred speech; very hot, flushed skin; rapid pulse; headache; dilated pupils; and muscle spasms. Heatstroke is serious and needs medical attention. With heat exhaustion your body becomes too hot, because you haven’t been drinking enough fluids to keep it cool. You’re likely to become pale, feel dizzy, nauseated, and thirsty, with an extreme headache. If you’re outside and start experiencing those symptoms, go inside, preferably where it’s air-conditioned and start drinking lots of fluids, either water or a sports beverage. If you don’t feel any better within 30 minutes then seek a doctor. Preventing heat exhaustion comes down to common sense – drink plenty of liquids, exercise during the coolest times of the day, and wear loose clothes that helps keep you body cool, including a hat. 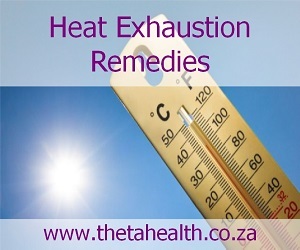 You can also use a natural heat exhaustion remedy. LIQUID MINERAL: One reason for heat exhaustion is that the body runs out of electrolytes, the minerals that help prevent muscle cramps. To prevent heat exhaustion in hot weather, take electrolyte liquid mineral supplements during the hotter periods of the year. Supplements that include calcium and magnesium and that are water-based help with hydration because they’re better absorbed. Add ¼ cup of the dried herb to 1 quart of boiled water. Steep for 30 minutes to an hour, strain, and refrigerate until chilled. ST. JOHN's WORT: If you are extra sensitive to the heat and prone to heat exhaustion, take four drops of St. John’s Wort flower essence a day, for at least a month. St. John’s Wort, the natural herb that is used to treat depression, can treat all illnesses related to darkness and light. You can take this for up to several months until your heat sensitivity improves. FRUIT: A natural source of electrolytes and water. Tasty fruits can help prevent heat exhaustion and dehydration. A lot of tropical fruits such as; mangoes, papayas, guavas, and pineappleare are full of electrolytes and water. GLONOINUM: Reduces heat exhaustion symptoms. This cooling remedy is for people with heat exhaustion who have a throbbing headache and a glowing red face. Dissolve two pellets of 12C potency Glonoinum under your tongue every 15 minutes. If you don’t feel better after two doses, see a doctor. If you do improve, take two pellets every 3 to 4 hours for the rest of the day. Using supplements for heat exhaution can assist your body in hydration and combat the effects of heat exhaustion and heat stroke. Bill Gottlieb has spent his lifetime learning and writing about health, helping millions of people achieve their health goals. He has written 13 health books that have sold more than 2 million copies, including the bestselling "Alternative Cures."